Inades-Formation Rwanda is a non-profit association of Rwandan law. Inades-Formation is the common name of “African Institute for Economic and Social Development – African Training Center”. Inades-Formation Rwanda was established in 1976. It was granted legal personality by Ministerial Decree No. 119 of 22 August 1977, revised by Ministerial Decree No. 75/11 of 18 April 2006. 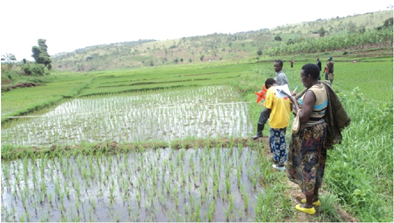 The mission of Inades – Training Rwanda is specified by its statutes: “To work for the social and economic advancement of Rwanda, especially through training activities, giving priority to rural populations”. The association is organized around the General Assembly which determines the general orientations. It currently consists of 27 members. The Board of Directors, composed of 7 members, is elected by the General Assembly for a three-year term. It develops strategies for implementing the guidelines and monitors the operation and management of the National Office. The 14-person executive team consists of trainers and administrative and support staff. Its task is to ensure the implementation of the orientations and strategies of the association.